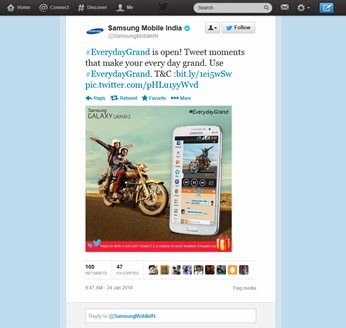 Samsung India launched The Galaxy Grand 2 on Friday (24th January). The mobile handset features an HD screen & front HD camera for a great visual experience – a feature the brand is bringing out through their campaign. Samsung leveraged its owned digital platforms including Facebook page, Twitter Channel and microsite to create a buzz-worthy two-day launch contest. In concurrence with the campaign tagline ‘Make the Everyday Grand’, followers, fans and users at large were invited to participate by sharing images of their #everydaygrand moments using the promo hashtag. Four participants with the most creative posts would stand a chance to win a Galaxy Grand 2! The hashtag #everydaygrand was trending on Twitter on both days. Great way to engage users and take the launch viral on social media. 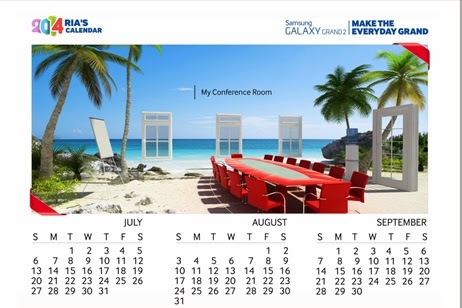 The Galaxy Grand microsite has a fun application that lets users select their boring everyday moments from four preset options which gets morphed into a personalized printable pdf calendar. 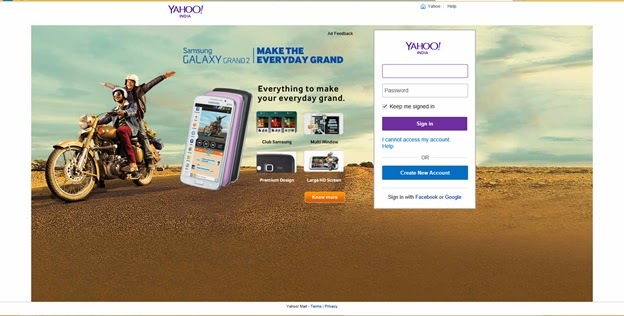 Samsung also executed a static Yahoo! Email Login page takeover on launch day. Samsung digital campaigns are among the few that I look forward to. Though simple, the executions are always interesting.